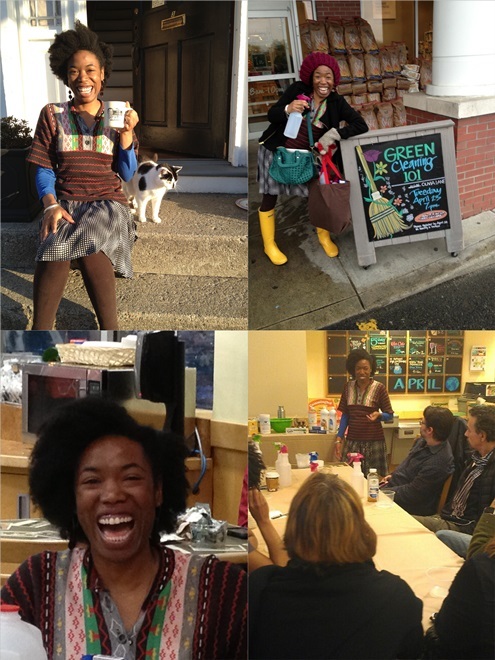 Yesterday I had a fabulous time leading a green cleaning workshop at Whole Foods Market here in Providence, RI. Even though I've lead the same workshop several times, I don't do them very often so I was a little nervous. An early evening shower and popping on my power sweater and skirt helped relieve my anxiety a bit. Any ladies with 4A-type natural hair have tips for blow drying braid outs? I very rarely use heat on my hair, but I need an emergency plan for wet braid emergencies that does not include wearing a wig or a hat! I'm open to other styles but once I've combed my hair in preperation for a braid out a wash-and-go is out of the question because my coils are gone and it's frizz-city! Thanks so much for reading this blog entry! I hope you enjoyed it. Please like Olivia Cleans Green on Facebook, join my email list, follow me on Twitter, and subscribe to my blog posts (by email, via Bloglovin', or with your preferred RSS reader) to keep in touch and discover more creative green homemaking tips. nervousness and I think your outfit defenitely spreads good mood! many greetings! I love your outfit, and I love how happy you look in all of your poses! Thanks for stopping by my blog! :) Love your pics and the outfit. Especially like the fun pop of color from the yellow rain boots! Green Laundry Tips Galore on Pinterest! Is Rubbing Alcohol Safe? What are Alternatives? WIWW: Saturday Sunglasses and Sass!